For fans of Marvel's tin-plated superhero Iron Man, Sega's tie-in to next year's Iron Man 2 movie may be the best videogame tie-in ever. The reason? It's being written by comic writer Matt Fraction... who also worked on the movie. [It's] a story that exists at the crossroads of the comics I write, the film universe I was lucky enough to be asked to contribute to, and a wholly immersive interactive experience like this game... Writing a game presents an entirely new challenge, where the player engages with the world, with the big and small aspects of the place and characters. They're a coconspirator in the narrative. I hope it's as exciting and challenging to play as it was to write. With a storyline about the abuse of Stark's Iron Man technology, the game will include characters who haven't yet appeared in the movie universe, including the much-anticipated Crimson Dynamo. This crossover between movies, comics and games is the latest step in Marvel's corporate synergy, which has previously included Ultimate Spider-Man writer Brian Michael Bendis working on the videogame of the character and created a short-lived MTV cartoon based on his take, in addition to the fabled Marvel Brain Trust of comic creators involved with plot decisions on Marvel Studios movies. 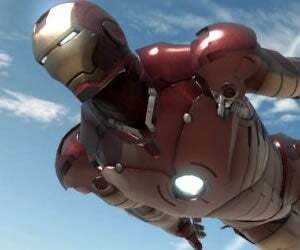 Sega's Iron Man 2 game will be released in Spring next year, ahead of the May release of the movie.